hara hara mahadeva tv serial airing every monday to saturday at 7.30 p.m on star suvarna channel. it’s the kannada remake of popular hindi serial devon ka dev mahadev. star suvarna channel made this hindu devotional serial in big budget. 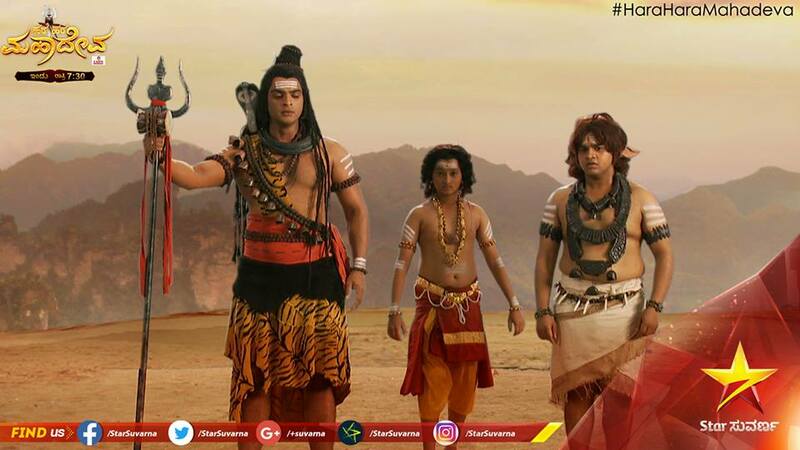 within short period harahara mahadeva serial become popular and well received by karnataka tv viewers. this mythological serial crossed 100 + successful episodes in suvarna channel. popular mini screen and big screen artist are appearing in the star cast of this serial. hara hara mahadeva is based on lord shiva, his life and miracles. Vinay Gowda plays the role of lord Shiva in hara hara maha deva tv serial. if you are searching for the hero name of harahara mahadev, answer is vinay gowda. he is playing the character lord shiva in this hindu mythological tv serial. Mohit Raina played this role in devon ka dev mahadev serial. vinay gowda justifies his role and well received by kannada tv audiences. sangeetha doing the role of sati in this suvarna tv serial. Mouni Roy played the same in it’s original version. Priyanka Chincholi as Parvathi playing another important character. you can check the complete cast and crew of hara hara mahadeva serial in another post. star suvarna telecast special episodes of this serial, we have wrote about the same here. this serial helped star suvarna to improve their television rating points. you can check the telecast time, repeat telecast details, online watching links etc of hara hara mahadeva from here. time – every monday to saturday at 7.30 p.m.